Ramallah 15th October 2011 – From 14 October until 9 November, a group of 14 Italian volunteers will take part into to the Palestinian olive harvest in the West Bank, under the umbrella of the project Peace Civilian Intervention, organized by the Association for Peace, International Civil Service and Un ponte per…. At the invitation of the Popular Struggle Coordination Committee, the volunteers will accompany Palestinian farmers harvesting in their orchards. At a time of increasing settler violence and attacks against Palestinian farmers, their trees and their lands, a non- violent intervention and the participation of international volunteers during the olive harvest season can make a difference in protecting Palestinian communities. Most of Palestinian farmers have already paid a very high price, being deprived of their lands and water sources by the construction of the wall, the ongoing settlements expansion and the military occupation. Even though olive harvest has been anticipated in order to avoid settler attacks, such as in Nablus and Hebron areas, hundreds of olive trees have already been uprooted, vandalized or burned. These violations of Palestinian human rights show how settlers act under their government’s impunity and under the indifference of the international community. 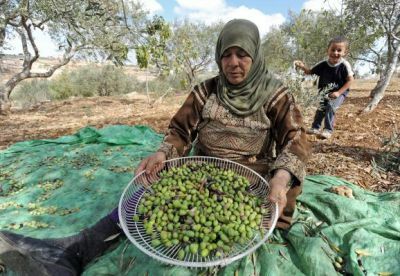 The Italian volunteers, who during the first period will be accompanied by Luisa Morgantini, former Vice President of the European Parliament and spokesperson of the Italian Peace Association, will be olive harvesting in the two villages of Al Masaara and Burin, in coordination with the Popular Struggle Coordination Committee and will spend time with Palestinian families in their olive groves and homes.